Links to all my writeups for the previous HG films available here. So, if you truly understood the message of The Hunger Games (I mean... some CLEARLY. Did. Not), you should not go into this movie expecting to be "entertained." I cannot with conscience give this a "Two thumbs up, fine family fun!" sort of review. Don't go into this expecting to have fun. Don't go into this expecting to be amused. Don't go into this expecting an escape from the very harsh realities of the world we live in today. Because that's what I feel this series is all about - The Hunger Games is not about a teenage girl in a love triangle (which so many people mistakenly assume), it's about a corrupt government, it's about systemic inequality, and it's about war. It's about a nation that is fed up with seeing its children die, if not from violence of the "entertainment" they provide to the wealthy elite, then from being executed by its military police. It's about the sacrifices, the casualties, that occur when you're trying to create a better world for future generations. If I felt that the first Mockingjay was gut-wrenching and unflinching in its portrayal of the effects of the violence of Panem's world, then this second one definitely left me shaken and disturbed. Much like Deathly Hallows Part 2, there is a war happening here, and nothing/no one is safe. (Tiny spoiler though: Prim's cat survives.) The tagline is "Nothing can prepare you for the end," and I believe it - as someone who has read the book multiple times (though, not anytime recently), I knew what was going to happen, but that didn't stop me from feeling distraught. Knowing what was coming didn't make it any easier to see beloved characters dying, to see Peeta being horrifically triggered by the sound of gunfire and explosions, or to see Katniss shouldering a burden that no teenage girl should ever be asked to carry. It was rough to imagine while I was reading the book; it was even more visceral and hard-hitting to see it on-screen. 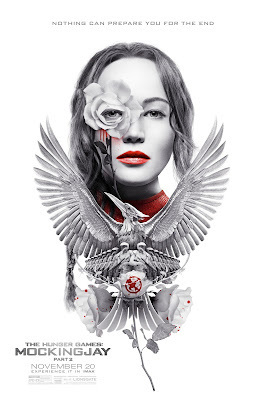 Mockingjay Part 2 was a fitting end to the series in pretty much every way. The first movie was a decent adaptation, and every single one after that has just been amazing, in the way they've managed to capture exactly what was important from the books while trimming out things that seemed extraneous. For people who complained that Part 1 was boring (which I heartily disagree with! ), Part 2 definitely has more action. But it's ugly. Aside from one particular spoilery moment, they won't leave you cheering - they will leave you covering your mouth in horror and grief. It was hard to watch, but it's important. When President Snow tells his loyalists that the rebels are coming because "they hate our way of life and are coming to destroy it," how can you not be reminded of similar comments made by our current mainstream media? I personally hope that this series endures as an important mirror on contemporary society, and that once all the movies (and books, of course) have been around for a while, and the Hollywood hype machine has finally extracted its claws from all the potential marketing/publicity opportunities related to this franchise, it will finally get some more credit. So yes, see this movie. But don't see it because you're looking for a good time - see it because you're dismayed by the world around you right now. See it because the subject matter means something to you. See it because you don't want to see your world turn into this someday. Or, see it because you know it already has, and you want to believe that things can change.